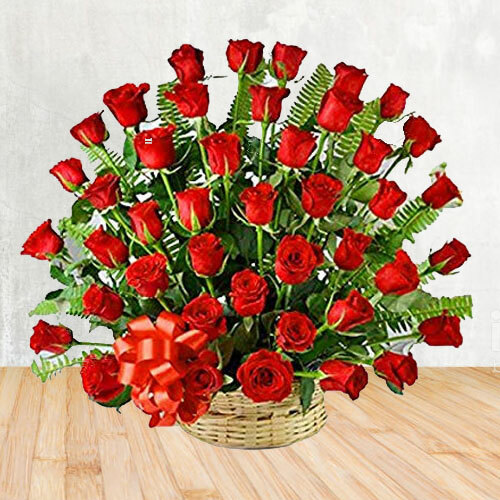 Let your loved ones cherish the moment that this gift of Exotic 50 Red Roses Passionate Bouquet creates with the essence of your love for them. Delight your loved ones with this Rose Bouquet with Green adornment. 50 Red Roses Arrangement with Assorted Cadburys Chocolate. 50 Red Roses Arrangement with Balloons, Teddy. 50 Red Roses Arrangement with 500grms Assorted Sweets. 50 Red Roses Arrangement with 16 pcs Ferrero Rocher chocolate box.